Places must to see that near Hop-On, Hop-Off bus stop. A 1.5-tonne bomb with an intact fuse was successfully removed from the Red River in Hanoi at 1.p.m on November 28. The Capital City High Command on Sunday concluded that an object found near Long Biên Bridge’s abutment P13 was a bomb left over after the war. Start running from october 2017, Hanoi Golden Route City Tour is a co-working product by Hanoitourist, Van Mieu Literature and Vietnam Fine Art Museum. This tour is "Hop-on, Hop-off" type - a model city tour from many other countries. Hanoi Golden Route City Tour connected with many travel spots, restaurants, hotels, shopping that provide guide service. The tour has 15 stops: Thang Long Opera Hotel, Sofitel Legend Metropole Hotel, Hilton Opera Hotel, Melia Hotel, etc. Tourist can use this tour to visit almost all attraction sightseeing at Hanoi Old Quarter. Located on a small penisula on the East side of West Lake, Tran Quoc Pagoda is regarded as the most ancient pagoda in Hanoi with its history line of more than 1,500 years.The architecture of this Buddhist center is a subtle combination between the solemn and beautiful landscape on the peaceful and quiet ambiance of West Lake’s surface. Thanks to these historical and architectural values, Tran Quoc Pagoda attracts many tourists to pay a visit, both inside and outside of Vietnam. 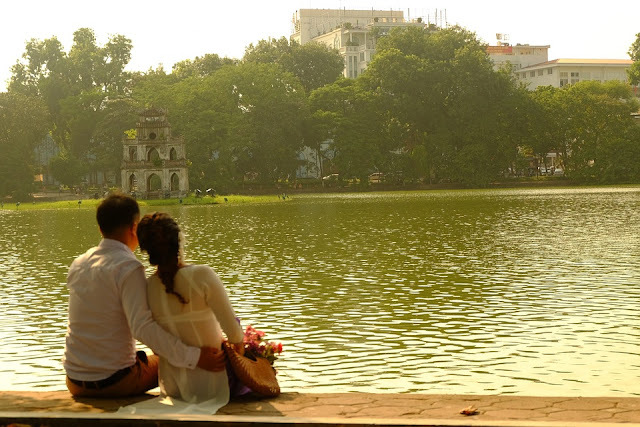 Hoan Kiem Lake in Hanoi attracts tourists and locals looking to get away from the noise and frenetic pace of the city. Peaceful and quiet, the lake surrounds Ngoc Son Temple, a pagoda sitting in the centre on a small island. The temple attracts many visitors and was built in commemoration of the 13th century military leader Tran Hung Dao who was renowned for his bravery in the battle against the Yuan Dynasty. Homage is also paid to scholar Van Xuong and Confucian master Nguyen Van Sieu. The island on which the temple is built is known as Jade Island and is accessible by the iconic Huc Bridge or Rising Sun Bridge which is a charming scarlet-painted wooden bridge of classical Vietnamese design. The pagoda is also guarded by two towering posts decorated with Chinese writing. The lake and temple are probably the most famous place. Ngoc Son Temple was built in the 18th century on Jade Island in the centre of the ‘Lake of the Returned Sword’ or Hoan Kiem Lake. Legend describes how an emperor was once given a magical sword which helped him defeat the Chinese Ming Dynasty and in doing so saw the return of the Golden Turtle God to the lake. Today ‘Turtle Tower’ stands close to the lake in memory of this legend. There are also endangered large soft-shell turtles swimming in the lake, and to see one of these gentle giants is considered very auspicious. The name of the temple translates to ‘Temple of the Jade Mountain’ and is predominately dedicated to war hero General Tran Hung Dao who defeated an armed force of 300,000 soldiers sent by Mongolian Emperor Kublai Khan in the 13th century to invade Vietnam. Also inside the pagoda are a large bronze bust and other deities. There are altars dedicated to Tran Hung Dao, some ancient artefacts including ceramics and a preserved specimen of a giant turtle found in the lake weighing 250kg. Hoan Kiem Lake The lake and the temple offer plenty of trees and shaded spots in which to escape the busy city streets. To get there head towards the Old Quarter and the main post office which is located next to the lake. Tickets are purchased at a booth located on the left-hand side before you cross the bridge. The temple opens at 08:00 and closes at 17:00 every day and its best to get to the lake as early as possible to watch the locals do their morning yoga and Tai Chi. 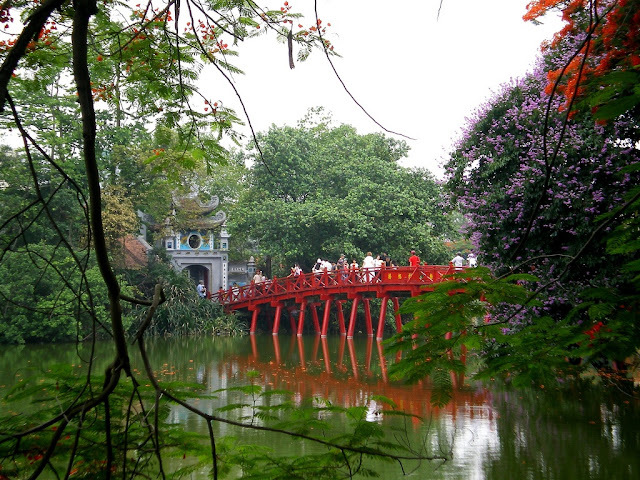 To get to the temple, walk across the flag-lined bright red Huc Bridge across to Jade Island.